What’s in the press this week? Now is the time to start applying Industry 4.0 concepts to the pressures and constraints of operations. For the last several years, Industry 4.0 — a concept that spans a mix of technologies that constitute a fourth industrial revolution — has intrigued many supply chain professionals because of its potential to address the challenges of running operations more efficiently. Industry 4.0 is about using technology to make supply chain operations more responsive and efficient. The first big shifts in manufacturing were around once revolutionary approaches, like assembly lines and the first wave of computerisation. Now Industry 4.0 posits that by having digital, near real-time knowledge over resources, constraints and workflows, and by applying data-driven insights to systems on the floor, you can run operations much more efficiently whilst adapting to consumer demand. Industry 4.0 spans multiple technologies, but at a high level, it means that via digitalisation we can respond to customers in an accurate, cost-efficient way. While these ideas are compelling, the next step is to figure out how to apply them to environments such as factories, supply chains, distribution centres (DC), and the ‘intralogistics’ processes within the four walls that are so vital to order fulfillment. In short, how do we take Industry 4.0 building blocks such as robotics, Big Data, sensors, and Internet of Things (IoT) connectivity, and turn them into smarter, data-driven operations? 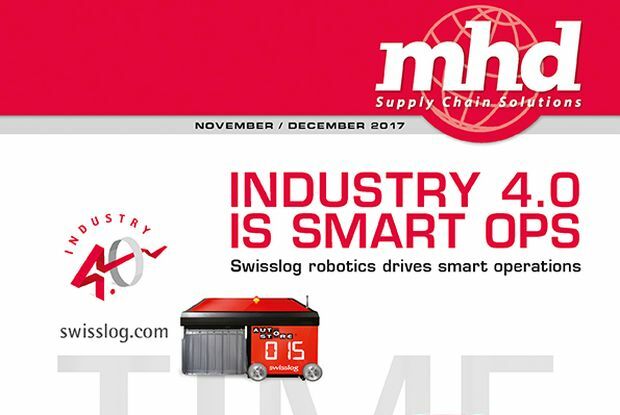 In Swisslog’s approach to Industry 4.0, software plays a key role in achieving data-driven operations that can instantly adapt to changing customer requirements, while taking out costs and being far more flexible than previous generations of automation, explains Francis Meier, managing director for Swisslog ANZ. The resources in warehouses and plants include human labour. The idea of a completely automated facility that doesn’t need workers — a so-called ‘lights out” approach in which everything is automated — has been around for decades, but has proven elusive, in part because past generations of robotics weren’t very flexible. However, now companies can deploy a new generation of robotics that are smart, meaning they know the status of other systems, and can work safely alongside humans. While human-like robots that can think and talk tend to capture our collective vision of ‘advanced’ robotics, in industry the real advance is the availability of collaborative and mobile robots. They might not look like a Star Wars’ ‘droid’, but they can sense and learn from their environments, make decisions, and be either mobile or easy to configure in a modular fashion. This new breed if intralogistics robots make use of vision-based navigation, sensors, and machine learning to allow them to do things like work safely alongside humans and move through warehouses in efficient, safe patterns. They are also synchronised via software with demand requirements coming down from enterprise-level systems, and with other automated systems within the four walls. Swisslog’s solution set exemplifies this new breed of robotics that can collaborate with humans and synchronises with both enterprise- and control-level processes. The warehouse software layer is important, because it coordinates real time automation processes with enterprise management systems, including traditional warehouse management system (WMS) and enterprise resource planning (ERP) systems that companies typically used to manage orders and other transactions. For example, Swisslog’s advanced warehouse software, called SynQ, spans automation control, material flow control and warehouse management functions to handle the coordination role. 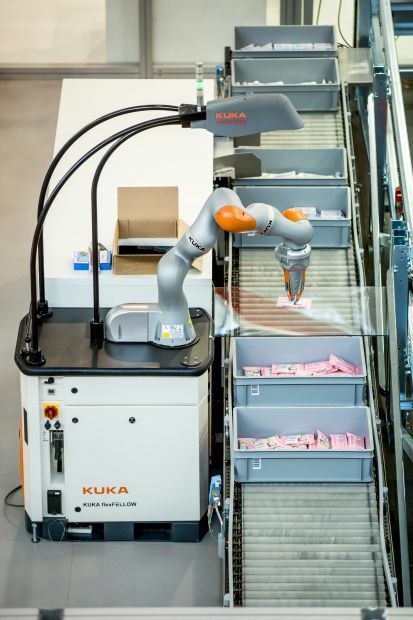 Additionally, robotics from Swisslog’s parent company KUKA, as part of its AutoPiQ solution, are smaller, collaborative robotics or ‘co-bots’ that can work safely alongside humans. To accomplish this, co-bots use sensors to instantly stop movement if something enters its path. The result is that companies can leverage picking robots alongside workers for intralogistics processes, using warehouse software such as SynQ to intelligently coordinate the automation with available resources and incoming order details. The robots of the past, while perhaps good at handling the same part or executing the same assembly process repeatedly, aren’t suited to today’s requirements that typically involve a complex, high velocity order mix, explained Mr Meier. “To achieve the speed, accuracy and throughput needed today, more facilities need to automate, but the automation they put in must be flexible and smart in the way it uses software to coordinate with the demand side, and other systems, within the four walls,” said Meier. 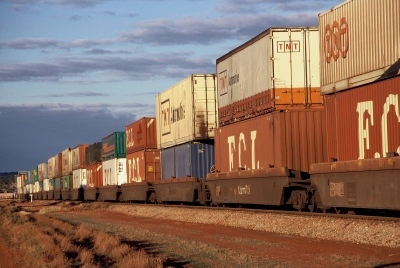 Other types of automation, such as goods-to-person robots (carts that tow goods to an ergonomic, light-assisted picking stations) or modular robotic systems that build mixed pallets, are part of the shift to flexible automation made possible via Industry 4.0 technologies, according to Sean Ryan, head of sales Swisslog ANZ. Building mixed pallets quickly and accurately is a common challenge in DCs. It can be done with human labour and lift equipment, but that grows costs for higher volume operations. Robotic arms can build mixed/layered pallets, but in the past, this tended to carry a high price tag, especially if paired with fixed conveyor system and/or large shuttle systems to buffer and move goods to the palletising arm. Today, newer, more modular approaches are possible. Under Swisslog’s ACPaQ, robotic systems for de-palletising and palletising can be paired with CycloneCarrier shuttle technology to enable a fully automated process controlled by the SynQ software. The shuttle system is modular, meaning it is available in different dimensions and can be expanded to add capacity. 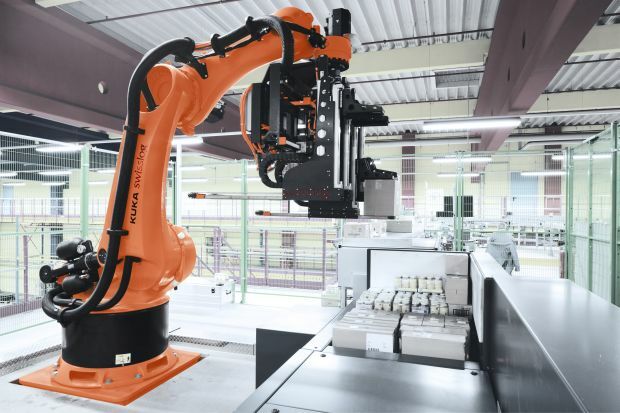 The core of the system is a palletising robot from KUKA called RowPaQ that has a unique 4-finger gripper that gives it the versatility to gently handle a wide range of products. A RowPaQ cell is capable of setting down up to 1,000 cartons per hour in the exact location predefined by the palletising software. To scale up, additional RowPaQ cells can be added. 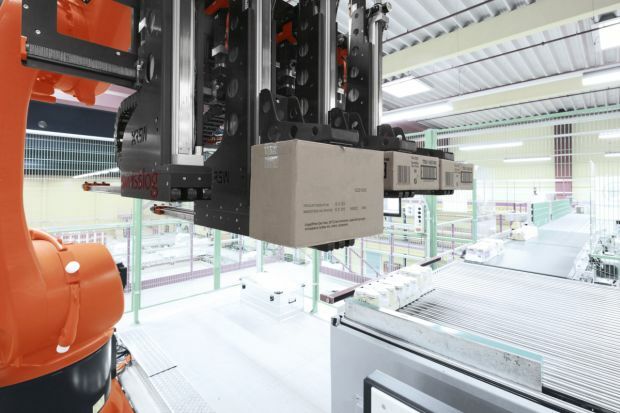 Robot-based palletising builds on an intelligently organized process. Before cartons can be palletised in sequence, they are first separated, loaded into trays and stored temporarily in the shuttle system. 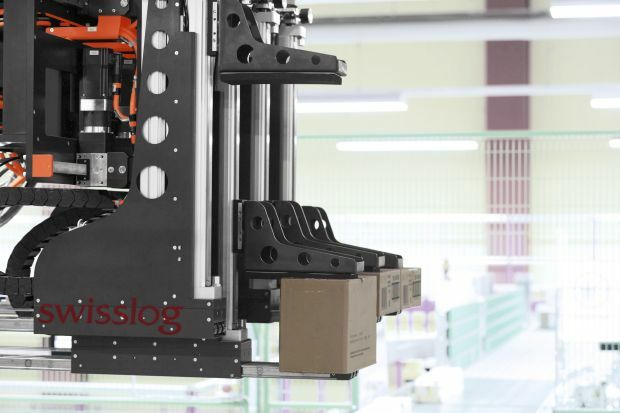 Even before a WMS issues the palletising order, Swisslog’s software autonomously performs a complex calculation process based on product parameters to determine the best way to load the pallet. Based on this intelligence, the cartons are transported in the exact sequence from storage to the palletising cell. After palletising is complete, it is shrink-wrapped and transported via conveyor to the right shipping station. Industry analysts predict the new robotics will catch on. IDC Manufacturing Insights forecasts that by 2018, 30% of all new robotic deployments will be collaborative robots and 45% of the top 200 global ecommerce and omnichannel commerce companies will deploy robotics in their order fulfillment, warehousing, or delivery operations. Other technology elements that fit with the Industry 4.0 concept are Big Data and digital representation of physical processes, also known as the concept of a ‘digital shadow’ of an operation. The benefit of this latter technology is that by digitalising the resources, constraints and workflows in a warehouse, assembly line or a supply chain, a company can more easily adjust its processes to reduce costs and meet demand. The key with Industry 4.0 and related technologies such as Big Data is to examine how they can support intelligent decisions for specific operational goals, according to Dr Kerstin Höfle, IP and strategy manager for Swisslog Warehouse & Distribution Solutions (WDS). “We already have huge amounts of data from operations,” Mr Höfle said. “The idea isn’t necessarily to get more data, but rather to connect to and integrate the data we already have, analyse it, and use it to make better decisions. In the end, the idea is to make Big Data smart.” Common areas to improve via analysis include throughput of orders, optimisation of labour and material flow, inventory replenishment levels, as well as predictive maintenance. “The future for intralogistics isn’t from a single technology like robotics, or sensors, or even Big Data, but rather how these elements can be tied together with software to drive operational improvements like fulfilling orders with lower labour costs,” Mr Meier concluded. For more information call (02) 9869 5900 or email wds.au@swisslog.com.